PROCussionCare® PedalLube is a specialized lubricant formula that lifts away and removes dust and grime, then provides a micro-thin lubricant barrier to eliminate noise and facilitate silky-smooth playing response. PROCussionCare is recommended for kick pedals, hi-hats stands, thrones, mounts, and all other moving metal parts of the drum set. Once applied, the formula will not migrate or build up. Will not affect fine drum shell finishes. PedalLube’s conditioning and lubricant formula transforms the maintenance of bass drum pedals, hi-hats, racks, and other drum hardware where instant response and noise-free performance is vital. Annoying squeaks, friction, or sluggish response can disrupt your groove on the drums – PROCussionCare takes care of all these potential problems in one easy step. 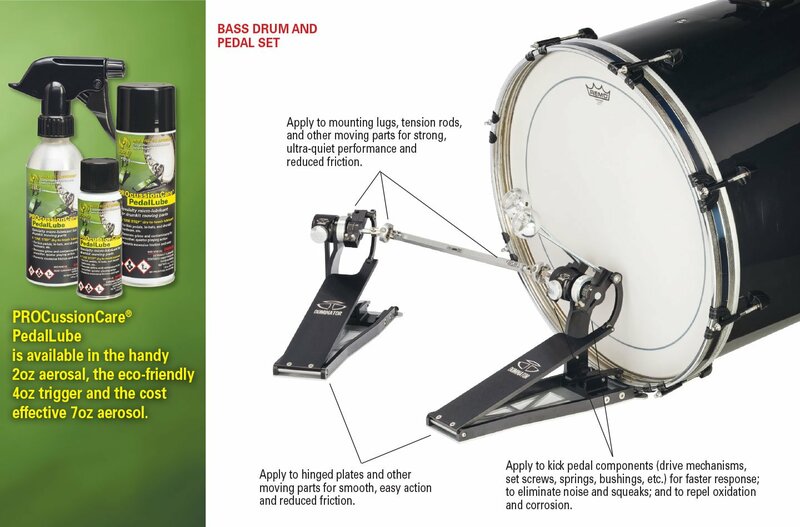 Using PedalLube also decreases cross-talk among toms, snare, and cymbals, with enhanced lubricity acting to isolate the vibration of the various drum set components and increase the clarity and separation of your drums during performance. Ensure that your hardware is up to the job – put ProcussionCare Pedal Lube in your road case. Three sizes are ideal for use in the shop, on the road, or in the studio. Also available with ProcussionCare’s WearBarrier and CymbalCare in a three-pack for a total drum maintenance package.